Supermarket HVAC/R is a large industry in the US. They make up 2% of commercial building space and account for 6% of total commercial building energy consumption in the states. 1 A lot of a supermarket’s energy costs comes from refrigeration, so greater energy efficiency in refrigeration can mean greater net profits for supermarkets. HVAC and refrigeration techs can help these businesses save money through improvements and preventative maintenance. Placing doors on refrigerated display cases: Adding doors may reduce the energy output of medium-temperature cases by 24%. Another advantage of doors in refrigerated aisles is increased comfort for shoppers. Retrofitting cases with LED lighting: Using LED lighting saves another 5% in energy consumption. Retrofitting fans with electronically commutated motors (ECMs): Replacing shaded pole or split capacitor motors with ECMs can save 4%. Using no- or low-heat doors on low-temperature cases: Switching to no-heat doors may save 250-plus W per door while low-heat doors (in humid areas) can save about 200-212 W per door—or 10% in energy use. Installing sweat misers on cases: Anti-sweat heater controls are more energy-efficient because they allow door heaters to be cycled based on store conditions. Utility incentives: Most utilities offer these incentives, which cover a lot of different energy efficiency measures. Some projects may need pre-approval to qualify, so make sure to contact the utility at the beginning. On-bill financing: This option allows for a loan for an energy efficiency project to be paid back by the supermarket’s energy savings. These loans hare generally inexpensive. However, their availability is limited and initial capital funding may be needed. Traditional financing: Some may be concerned about the interest rate and the additional costs, but the money they save through an energy efficiency project will likely exceed what they paid in interest rates. PACE financing: Available in 29 states and Washington, D.C., this program offers low interest rates on loans repaid through property taxes. They can be a good choice for expensive projects that have a long return-on-investment schedule. Minimum term for this loan is 5 years. A focus on energy-efficient technology and preventative maintenance can translate into substantial profits for supermarkets. 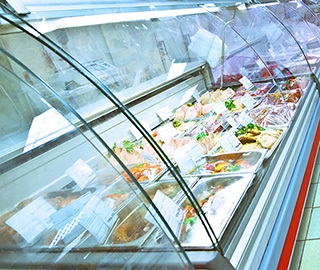 Energy-efficient refrigeration can save supermarkets thousands of dollars, increase consumer comfort, and protect the environment.